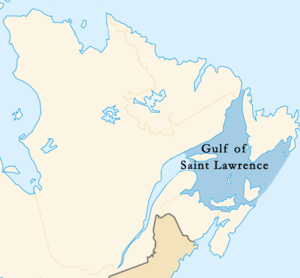 The Gulf o Saunt Lawrence (French: golfe du Saint-Laurent), the warld's lairgest estuary, is the ootlet o the Great Lochs o North Americae via the Saunt Lawrence River intae the Atlantic Ocean. The gulf is a semienclosed sea, coverin an aurie o aboot 236,000 square kilometres (91,000 sq mi) an containin aboot 35,000 cubic kilometres (8,400 cu mi) o watter. The Gulf o St. Lawrence is boondit on the north bi the Labrador Peninsula an Quebec, tae the east bi Newfoundland Island, tae the sooth bi the Nova Scotia peninsula an Cape Breton Island, an tae the wast bi the Gaspe Peninsula, New Brunswick, an Quebec. As for significant islands the Gulf o St. Lawrence contains Anticosti Island, Prince Edward Island, an Cape Breton Island. Hauf o the ten provinces o Canadae adjoin the Gulf: Atlantic Canadae, the provinces o New Brunswick, Nova Scotia, Prince Edward Island, Newfoundland an Labrador, in addition tae Quebec. Besides the Saunt Lawrence River itself, significant streams emptin intae Gulf o Saunt Lawrence include the Miramichi River, the Natashquan River, the Restigouche River, the Margaree River, an the Humber River. Branches o the Gulf include the Chaleur Bay, Miramichi Bay, St. George's Bay, Bay o Islands, an Northumberland Strait. The Strait o Belle Isle atween Labrador an Newfoundland — 17 kilometres (11 mi) wide an 60 metres (200 ft)* deep at its deepest. The Cabot Strait atween Newfoundland an Cape Breton Island — 104 km (65 mi) wide an 480 m (1,570 ft)* deep at its deepest. The Strait o Canso atween Cape Breton Island an the Nova Scotia peninsula — 1.0 km (0.62 mi) wide an 60 m (200 ft)* deep at its deepest. Syne the construction o the Canso Causeway across this in 1955, the Strait o Canso daes nae permit exchange o watter atween the Gulf o St. Lawrence an the Atlantic Ocean. This page wis last eeditit on 8 Julie 2018, at 04:58.